I've had Simon vs. the Homo Sapiens Agenda by Becky Albertalli on my TBR for longer than I care to admit. I even have a finished copy sitting on my shelf, just waiting for me to read it. I finally decided to listen to the audiobook, as I recently posted about wanting to listen to it, and this version came highly recommended. Having finally read the book, I'm kicking myself for not having read it sooner! The main character in the story is Simon, a not-so-openly gay, 16-year-old theater buff. Simon is pretty adorable. There is so much about him that I love, including this love for his family and friends, and for the theater as well. I love the emails between Simon and the boy he's been emailing with, Blue, which always had perfect grammar, and never failed to make me smile. And not only is Simon a great character, but there are also some really great secondary characters in the story as well. I loved all of his friends, and family, and his really awesome theater teacher. There are just so many nice people in this book, it's kind of unreal. There need to be more people like this in the world. If you know me at all, you'll know that I'm a sucker for a good love story. That's exactly what you get with this book. The storyline was cute and lots of fun to read, and reading it made me want to stuff my face full of waffles and Oreos. (I finally get the Oreo thing that everyone always talks about!) I also like that the book kept me guessing right up until the end. I had no clue who Simon's mysterious Blue was, but I was pleasantly surprised at the end. As I mentioned above, I listened to the audiobook version of the book, and I'm so glad I did. The narrator, Michael Crouch, did a wonderful job telling me Simon's story, and I loved all the different voices he did for the characters. I'm looking forward to listening to more audiobooks narrated by him in the future! 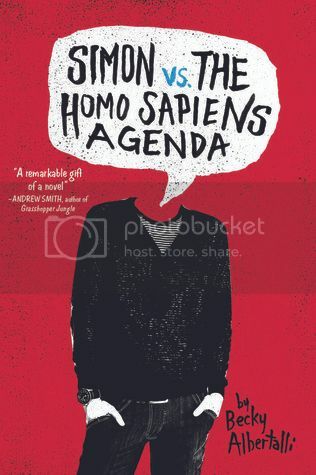 Overall; Simon vs. the Homo Sapiens Agenda is the first book I've read by Becky Albertalli, but it definitely won't be my last! I'm now even more excited to read her next book, The Upside of Unrequited, which sounds amazing, and is set to release April 11th 2017 from Balzer + Bray!! This is next on my audio list. I've heard so many great things about the book and the audio version. Your review has me even more excited to read it! I haven't read this yet but now I want to. I'd like to read about nice people for a change :) The story sounds really sweet too. Thanks for your review!